Roger Moore brought James Bond into the 1980s with a new hairstyle and a new tailor. 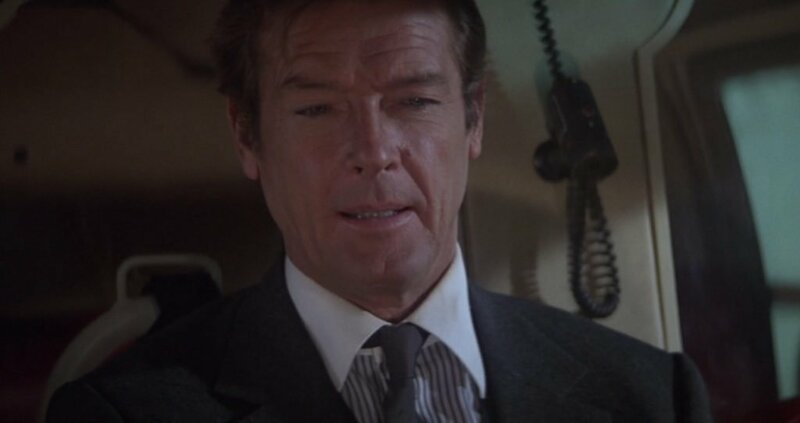 Starting in For Your Eyes Only, Douglas Hayward of Mount Street in Mayfair replaced Angelo as Roger Moore’s tailor. Doug Hayward had many other famous clients, including Michael Caine, Laurence Olivier, Tony Bennett, Noel Coward, John le Carré and Richard Burton. 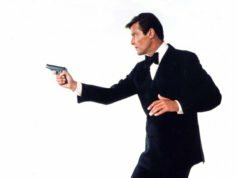 Roger Moore chose Hayward to be his tailor because was willing to visit Roger Moore at his homes outside the UK. Hayward became a close friend of Moore and continued to tailor his suits until Hayward’s death in 2008. Hayward’s suits did away with the wide lapels and flared trousers of the 1970s and brought in a more traditional look for the 1980s. Suit coats have either a button two or button three front, with three-piece suits for most of the London scenes. Roger Moore started in the 1980s with a charcoal grey flannel button three, there-piece suit. Hayward’s suit coats have soft shoulders with roped sleeve heads. The chest is clean and the waist is fitted. The overall length of the coat is on the long side and extends slightly below the seat. The cuffs have three buttons and the pockets are straight with flaps. The jackets have double vents. In For Your Eyes Only the trousers have a flat front, straight cut legs without turn-ups and are worn with a belt, including the three-piece suits. The waistcoat has a button six front and lower flap pockets. The only part of the suit that looks dated now is the low button stance. Both the button two and button three coats have a low button stance, with the buttons closely spaced. However, the low button stance suits Roger Moore’s body and was also the style of his suits on The Saint. But unlike the more fashionable suits of the 80s, Hayward’s suits had a high gorge, where the collar meets the lapels. The high gorge combined with a low button stance lengthens Moore’s torso and makes him look taller. The shirt is a navy and white Bengal stripe with a contrasting white collar and white cuffs, a very popular style in the 80s. The shirts in For Your Eyes Only have a tall spread collar with long points and two-button cuffs with a mitred edge. Bond wears a mildly slubby silk—like dupioni—plain charcoal tie with a small four-in-hand knot. The belt is black with a brass buckle and the shoes are black slip-ons. There aren’t any good overall shots of this suit in the movie, though there is a good picture in the book The Essential Bond by Lee Pfeiffer and Dave Worrall. The Frank Foster shirt was auctioned—but not sold—at Prop Store on 23 September 2015. Thanks for your reply to my question about the literary Bond and his suits. Why would you then think that Maurice Sedwell would be a good choice. Obviously Savile Row could be an investment, after I have saved up a bit more, but for now what specific details as far as the cut is concerned would you think the Literary Bond might fancy? I currently live in Hamburg and Munich, Germany, and am thinking about having some suits made by the local tailors, yet I need to be fairly specific. -his suits are "navy blue" or "black & white Houndstooth/doghtooth" ,lightweight and cut "comfortable" (what should that mean in the context of the 1950s and how should that be appropriately translated into the modern conception of a suit? )and are cut of serge, tropical wool or alpaca.His shirts are light blue, white and maybe cream sea-island, possible heavy silk for formal occasions. I assume his suits would not have belts and he would have worn cufflinks only with his dinner suits. Speaking of Dinner suits, they are black, and have satin lapels and buttons (I think more than that is not given). I would go for the more traditional peak lapels, and his shirt is made of heavy silk, would have studs and pleats. His shoes are polished black calf-leather "mocassins) (John Lobb loafers???). Specifics for evening shoewear is not given. Am I on point so far??? Coats offer a blue macintosh from Burberry, and (I assume)some type of crombie for winter/fallwear. I would appreciate to see if you might not add your insights to the issue. Many thanks to you for running this blog! It really is a great resource. I said Maurice Sedwell since the cut is in between the more structured military suits of tailors like Dege & Skinner but not as relaxed as Anderson & Sheppard. The black and white houndstooth suit is for more casual wear. Navy blue serge is his standard business suit. The literary Bond wore short sleeve shirts with his suits as Ian Fleming did, not something that one should copy. If you want to get a better idea of the literary Bond's look just look at pictures of Ian Fleming. He basically copied Bond off himself. The only difference is that Bond wore silk knit ties with his suits whilst Fleming wore bow ties. I much prefer the '80s Douglas Hayward suits (and their accessories) over the ones worn in the '70s. As the clothing got more conservative, so did the plots… for the better, I think. Unfortunately, Moore was starting to look too old to be a dashing super-spy. He did not age as gracefully as Pierce Brosnan did in his middle age. However, he remained on screen the longest out of all Bonds; 12 years from 1973 to 1985. Beautiful suits. Really good examples of timeless, classic English tailoring. 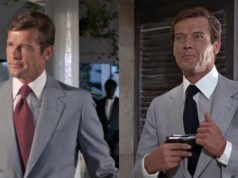 The suits Bond wears in For Your Eyes Only – charcoal, navy pinstripe, mid grey and tan – show Doug Hayward's talent as a tailor. Moore sports a navy double breasted blazer also by Hayward (presumably) for the Corfu scenes with Melina and shows how to pull off the "open neck shirt" look with style and panache. The shirt worn with the blazer, as with the tan and pinstripe suits in the movie, is a mid blue colour. Brosnan also carried off this look well. Other Bonds's less so. I like the Winchester shirt that roger Moore donned in this film. I think it actually looks great on Bond. Pierce could’ve pulled off the look as well. I don’t think a contrasting shirt collar would suit Daniel Craig. I wear these but only blue with contrasting white collar and double cuffs with a navy suit and navy grenadine tie or a rose red tie. Looks very nice! What’s your take on this type of shirt as bond Matt?